White is just right, especially when delivered in a field of green. This beautiful gift is a garden of delights, and a caring way to share your sympathy. 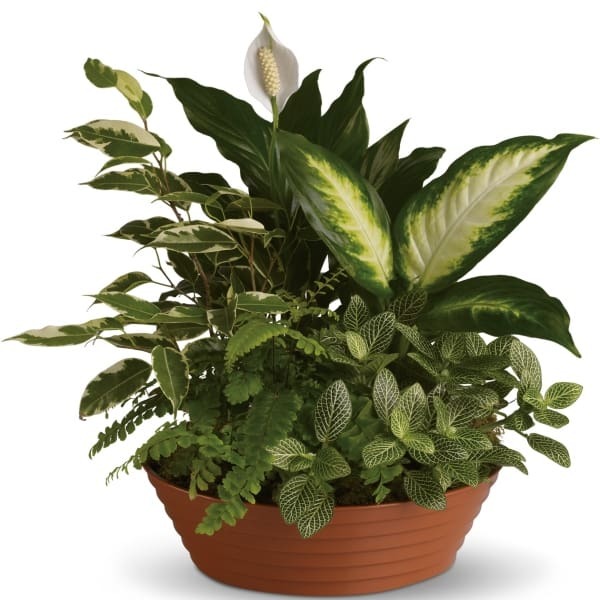 • A white hypoestes is joined by green dieffenbachia, spathipyhllum, ficus and Boston fern that's delivered in a beautiful clay dish. 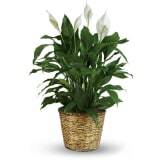 • Arrangement measures approximately 14 1/2" W X 15" H.
Flowers will be received by a Duddlesten Funeral Home's staff. I sent the plant to a friend out of state, so I never had a chance to see it in person. However, the service was excellent and I would definitely order again. 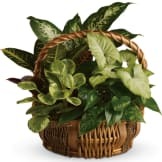 All of our flowers are designed and delivered by hand from a local florist in in Raymondville.